Full footswitching flexibility from clean boost to full-on sustaining distortion: all-in-one drive solution. Takes up a fair chunk of pedalboard real estate. 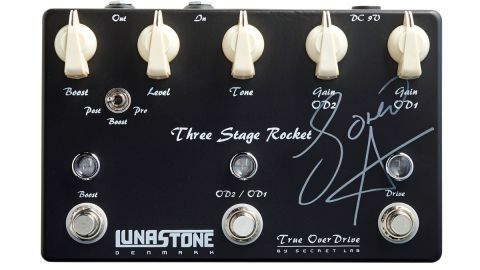 The Three Stage Rocket has been designed in collaboration with Danish guitarist and producer Soren Andersen. The pedal is based around the Big Fella’s circuitry and sound, but it expands on the design to include an extra footswitch that selects between the first and second gain stages of the drive section, which have also been given separate gain knobs. The Boost section has been revised, too, in that you get a Pre/Post toggle switch that places the boost before or after the drive section. This means that you can just add volume or can push the drive section for more gain. For just £40 over the cost of the Wise Guy you’re getting a lot of extra versatility that we think is well worth the outlay if the size of the pedal isn’t an issue for you and your ’board. However, while it is big, it can do the job of three separate pedals and could be the only dirt/ boost pedal you’ll need on your ’board.